Please refer to our stock # 3173 when inquiring. 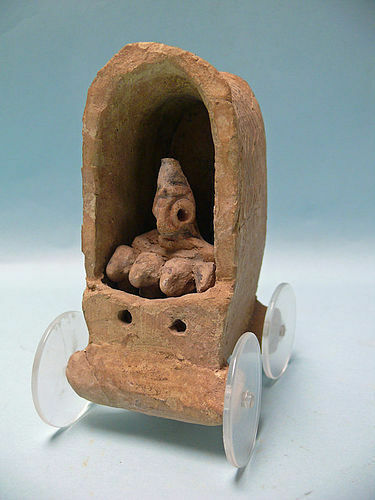 Syro Hittite Terracotta Chariot and Charioteer, ca 2nd - 1st Millennium BCE. Stylized figure with disc shaped eyes standing within a tall domed chariot. Incised decoration on chariot. Professional repair with some restoration. 5 1/4" x 2 3/4" x 3 1/2". With contemporary lucite wheels. Ex: Christie's London, 1972. The Battle of Kadesh (also Qadesh) took place between the forces of the Egyptian Empire under Ramesses II and the Hittite Empire under Muwatalli II at the city of Kadesh on the Orontes River, just upstream of Lake Homs near the modern Syrian-Lebanese border. The battle is generally dated to 1274 BC in the conventional Egyptian chronology, and is the earliest battle in recorded history for which details of tactics and formations are known. It was probably the largest chariot battle ever fought, involving perhaps 5,000–6,000 chariots. As a result of the multiple Kadesh inscriptions, it is the best documented battle in all of ancient history.